Ensemble Alioni went to the Republic of Georgia for a two week visit! Our singers toured several regions of the country and the capital city, Tbilisi -- studying Georgian vocal technique and learning songs in the traditional manner, person-to-person from Georgian master singers! Singers from Ensemble Alioni arrived in Georgia in the capital city of Tbilisi. After collecting the luggage we made our way out of the city and drove about two hours east to the town of Sighnaghi, which was the first stop on the learning tour. Click on the picture of the town below to journey along with us from the beginning (a new page will open). Or skip ahead by clicking on a picture further below for other places that we visited on our adventure! Considering the wide variety of terrain it's amazing to us that the entire nation of Georgia is roughly half the size of the state of Wisconsin! 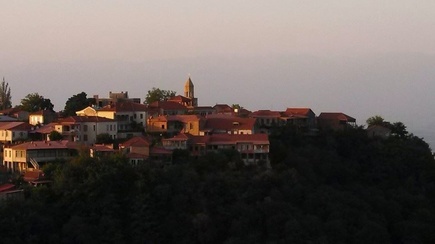 Click on the picture above to go with us to Sighnaghi in the Kakheti region, where we started our tour! 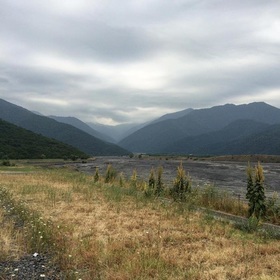 A dry riverbed and mountains near Qvareli. Come with us to Qvareli and enjoy our adventures there -- click on the picture above! 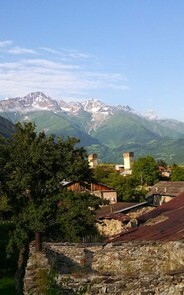 A view of the Caucasus mountains from the village of Lenjeri. Click on the picture above to journey along to the Svan region and share in our discoveries! 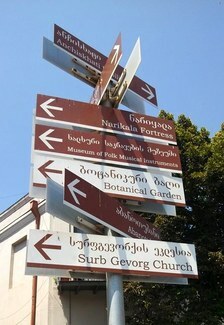 This signpost in the city of Tbilisi will lead you to the final stop on the tour -- if you click on it! Alioni is a 501(c)(3) non-profit organization! The ensemble's inspiring goal is to study with master singers from the Republic of Georgia. Alioni travels to Caucasus Georgia and brings knowledge and songs back with us to teach to Americans. We also perform these inspiring and unique traditional songs to the delight of audiences everywhere! You make it possible for Alioni to continue singing and teaching this spectacular music! All donations to Ensemble Alioni are tax-deductible to the fullest extent of the law. Your transaction is secured by PayPal services. No need to create a PayPal account -- major credit cards accepted! Click the button to start ~ Thank You! !